A nicely executed badge, this is the Gold Honour Badge for HJ members. This example is marked to manufacturer M1/78 (Paulmann & Crone, Lüdenscheid). It also has the RZM mark, Ges-Gesch (protected design) and the owners issue number. The badge was awarded to members of the HJ or BDM who joined prior to Potsdam Day (October 2, 1932) and had five years continuous service. 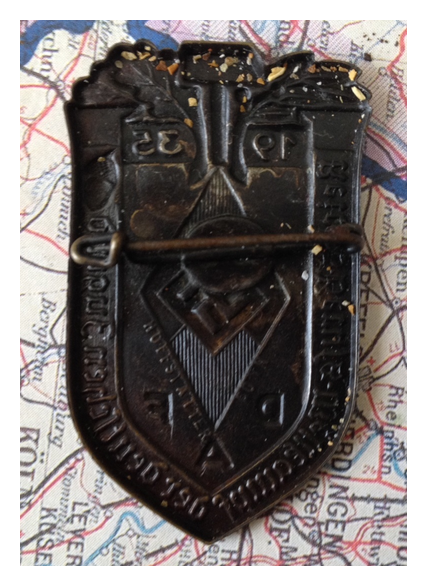 This is the BDM Proficiency Badge in Bronze (Leistungsabzeichen). It was issued to members of the Bund Deutsche Madel who passed proficiency tests in nursing, political awareness and athleticism, within one year. There were two grades, silver and bronze. They were numbered on the reverse unless it was a replacement badge in which case it had an A or B on the rear instead. This example has the RZM code M1/14 for the manufacturer Oeschsler & Sohn, Ansbach. This is a day badge or “tinnie” as the hobbiests call them. This is for the “Reichs-Berufs-Wettkampf der Deutschen Jungend”. This roughly translates to “National Vocational Challenge of the German Youth” for 1935. 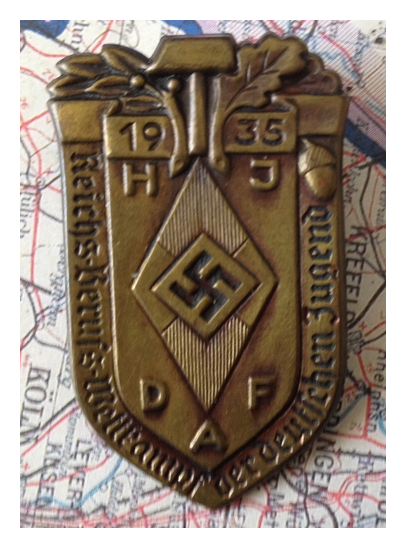 This is the bog standard, garden variety Hitler Youth membership badge. This one is RZM stamped for M1/122, I. Deutschbein G.m.b.H., Euskirchen. This is the Silver issue of the Leader’s Sports Badge for the Hitler Youth. It is RZM marked M1/34 for Karl Wurster of Mark Neukirchen. It is also serial numbered for 242065.